"We were so lucky to find Howl-A-Day Inn! My puppies' manners have improved greatly since being part of your daycare. On more than one occasion, the staff has gone above and beyond for the welfare of my three dogs! We have been to many daycares in the area, and had nothing but headaches and vet bills! 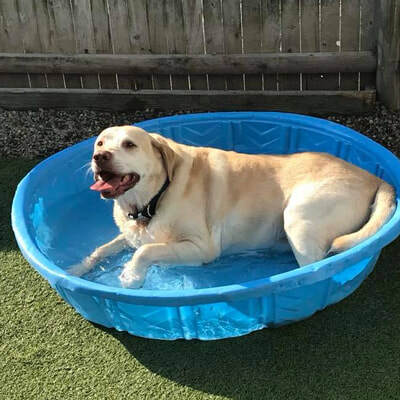 “I would like to recommend Howl A Day Inn for most dog owners who would like a safe, structured, clean environment for their beloved pet! 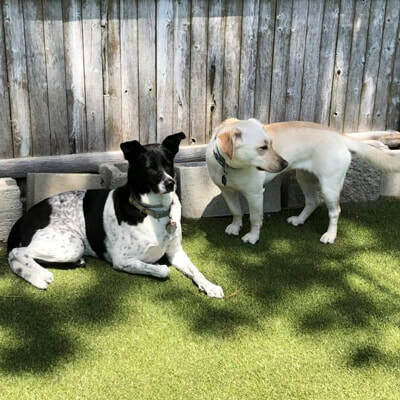 Howl A Day Inn has a staff which exceeds normal personnel levels at a daycare or boarding facility. They really do work with your dog instead of letting the dogs run for 8 hours in that "untrained dog pack situation". The staff may work with your dog on Sit, Stay, Down, Place, Quiet, Drop It, or Leave It. They will not train your dog, but will keep training going. The staff will play with your dog whether it be going through hoops, tunnels, weave poles, or even low safe jumps. 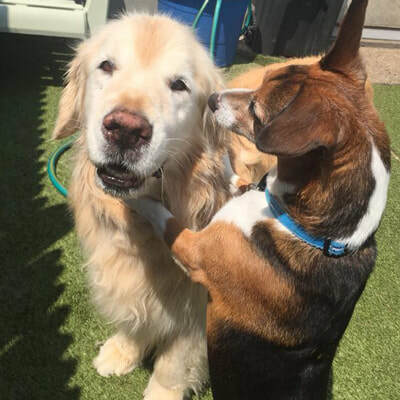 The staff will also place your dog up on the grooming tables and go through your dog's coat,clip nails and brush their teeth! Dogs are screened before being allowed to come. This means that the temperaments must be good! Health records are mandatory and all records are screened carefully. What is the name of the restaurant chain: Not Your Average Joe? Well Howl A Day Inn is not your average doggie daycare or boarding facility!!! 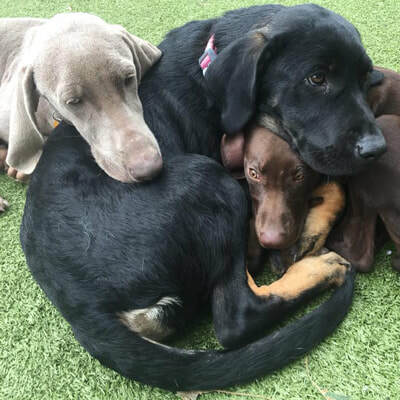 Owners Lynne and Matt White, who have created the perfect haven for your canine companions, are exceptionally passionate about providing the love and care that your pup needs and deserves while away from you. Master Dog Trainer, Matthew White has been training dogs for 20 years. He has many areas of expertise and specializes in training family dogs. He has also worked closely training law enforcement and military dogs. He completed his Master apprenticeship with world renown Master trainer Andy Hannalin, of K9 search and detection in NY,NY and Dogs by Andy in Mooresville, NC. Matt was given the opportunity to work with almost every breed of dog as well as all temperaments. To learn more about dog training services please click here. Participates in local intern and work study programs with the local high schools. In 2014, Matthew and Lynne White became owners of the Howl-a-day Inn. 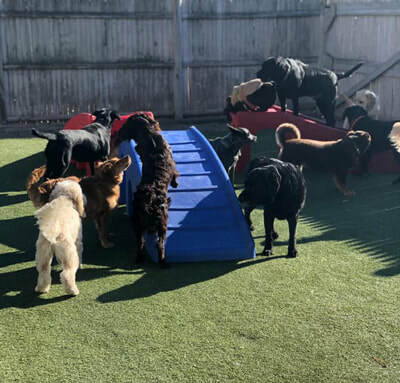 We offer daycare, supervised overnight boarding, and training of all types, including on/off leash obedience, service, agility, and protection to name a few. In 2015, we added a new indoor training facility on the premises! 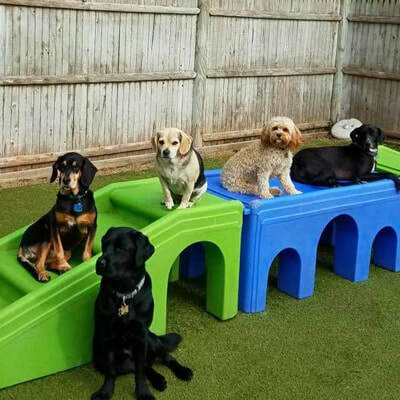 In March 2016, we just added new indoor playgrounds for even more stimulation for doggie play!